I must start off by immediately debunking the notion that a cheese pumpkin has anything to do with cheese. As put by Edible East End, "there is nothing cheesy about this squash except for its squat wheel-of-cheese-rind looks and its stinky reputation for sitting on front porches for Halloween." However, that porch-dwelling existence pales in comparison to the cheese pumpkin's robust culinary potential. Or, I guess should say, culinary history. Documented from the 1800s until the 1960's, this Long Island varietal was considered the acclaimed filling for every Thanksgiving pie. Said D.D. Tooker in the 1855 issue of Michigan Farmer, "the cheese pumpkin is the only true article in my opinion for making the most delicious of Yankee notions— pumpkin pie—and I am not alone in my opinions, for I have yet to see the individual who would not agree with me in this matter." OK D.D., I believe you—everyone loved the cheese. But in the 1970's, a Long Island seed saver named Ket Ettlinger started noticing that the treasured varietal was becoming difficult to find. In a panic for the future of his autumn pies, soups, and stews, Ettlinger shared his prized seedlings with a squash seed breeder and established a regional seed bank in Long Island to conserve the heirloom. Which, in turn, established the Long Island Cheese Pumpkin Project to "preserve, restore, and bring culinary awareness of this local variety." Long live the cheese! 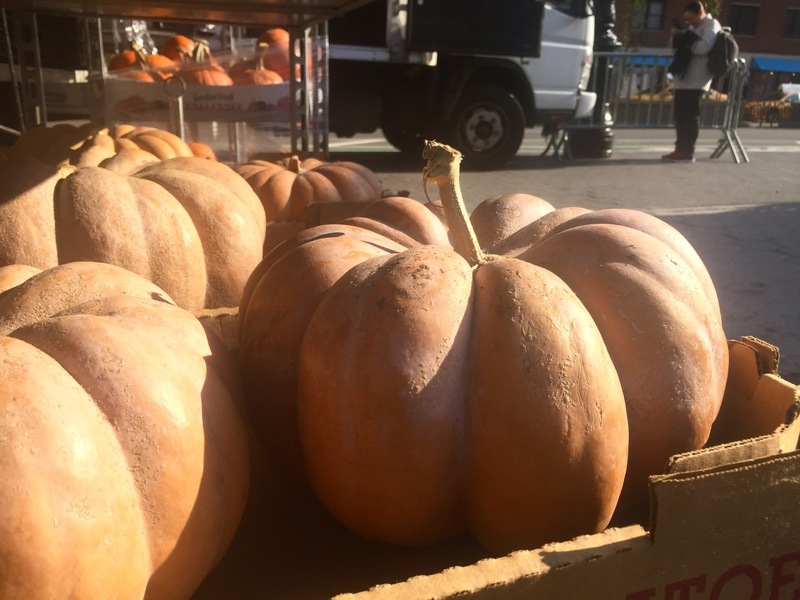 Did I know the pumpkin's fascinating history and near clash with extinction when I purchased it at the Union Square Greenmarket this week? Didn't have the faintest idea. Rather, annoyed at the toll the peeling, chopping, unseeding, and cooking of a plethora of squash varieties was taking on my manicures, I was on the hunt for a cucurbita was an easy prep. 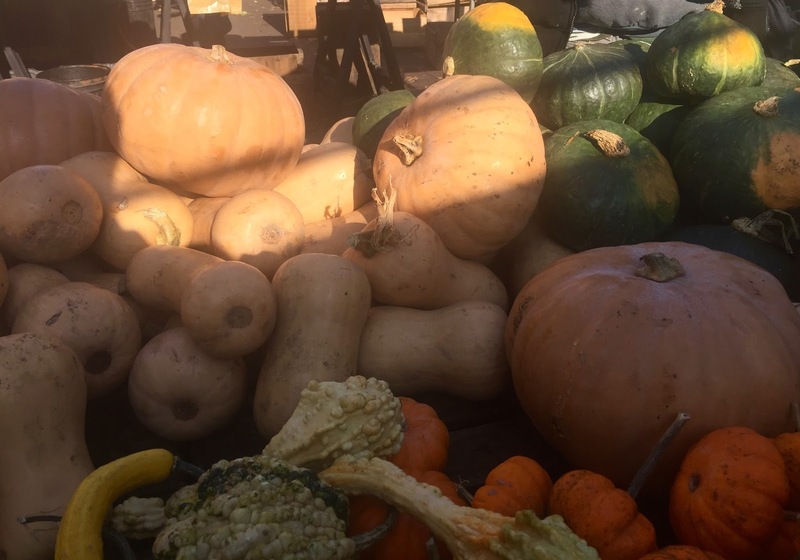 At Race Farm, adjacent to the whole squashes and pumpkins, I noticed giant, moon slivers of orange flesh and auburn rind—like a giant crescent of cantaloupe. Roast and eat as is, I was told, which sounded like minimal nail polish-chipping territory to me. I roasted the cheese pumpkin crescent with some peppers, carrots, and parsnips. Recalling the beginning of another squash recipe I enjoy immensely, I sautéed some onion and jalapeno in garlic and cumin while I waited for the veggies to roast. 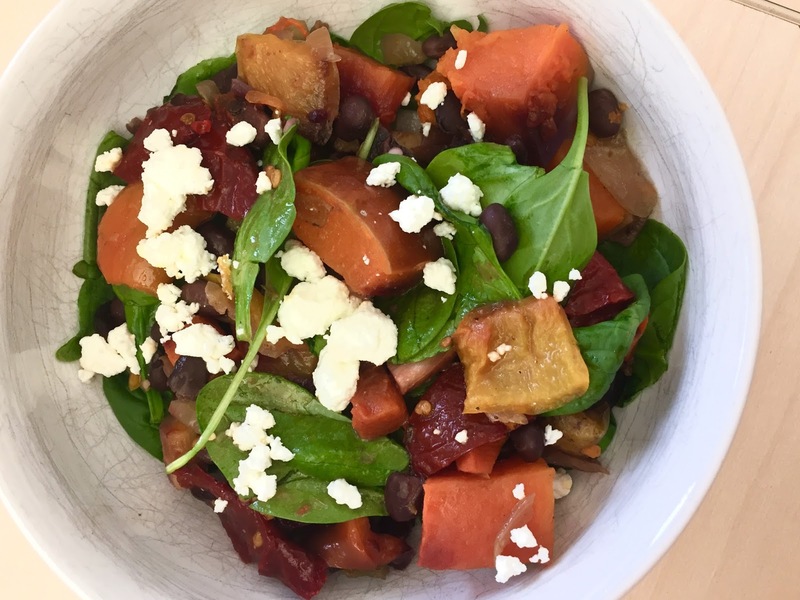 Into a giant bowl went whatever was in the fridge for the week's salad: black beans, goat cheese, spinach. I've always loved cucurbita paired with chipotles, so into the blender went my best guess for a chipotle vinaigrette: chipotles in juice, lime juice, orange juice, red wine vinegar, oregano, olive oil. I barely even thought about the salad as I packaged it up for a week of take-to-work lunches. But when I tried it the next day, I was blown away by the results. My intentions were haphazard at best, but the salad was absolutely terrific. And what stole the show? You guessed it, D.D. The cheese pumpkin! 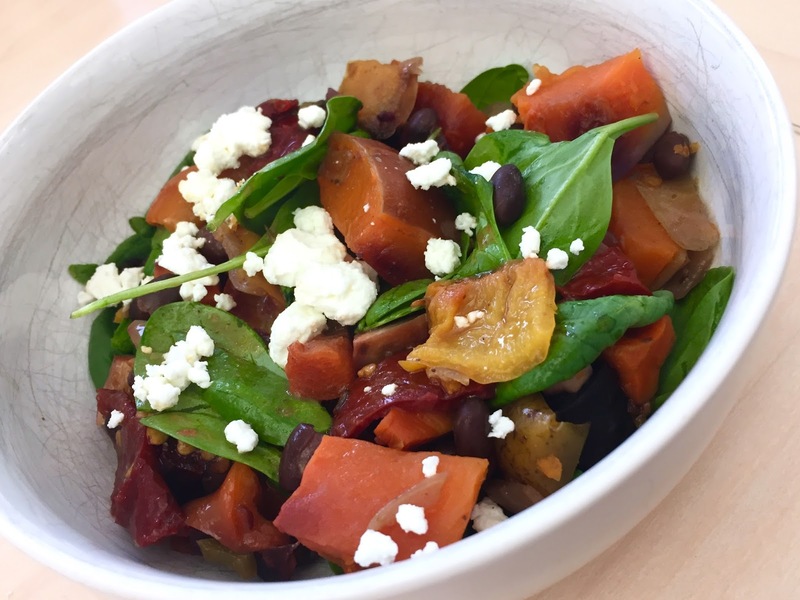 I ate this salad warm, and it was a belly-filling goodness: earthy, vibrant autumn vegetables; creamy goat cheese; crunchy spinach; tangy spicy chipotle vinaigrette. Definitely the most vivacious lunch salad I've had in a long time. Always a fan of the big batch salad, I can't recommend this one highly enough. 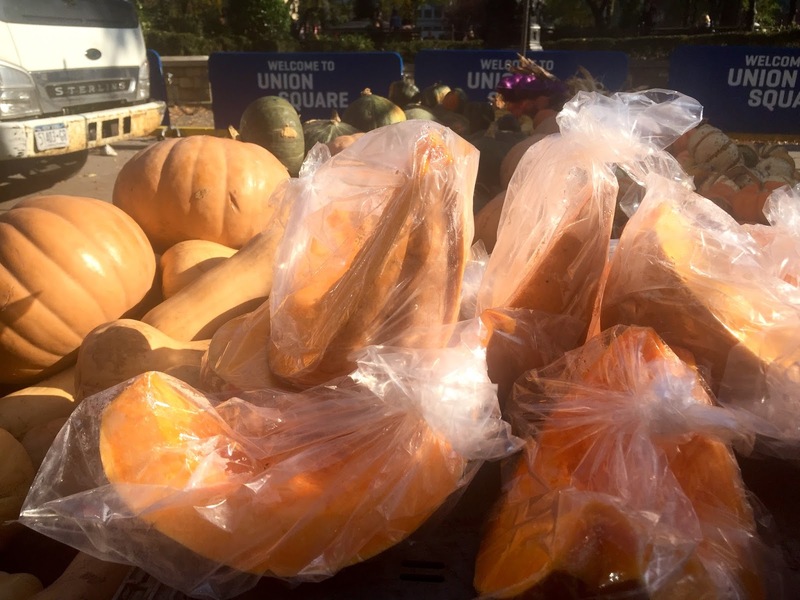 Plus, you'll aid the Long Island Cheese Pumpkin Project's mission by giving some love to our local cheese pumpkin. Next stop: pumpkin pie. Preheat oven to 400 degrees. Line a large baking sheet with tin foil and EVOO spray (or 1 Tbsp EVOO). Add pumpkin, carrots, parsnips, and peppers, sprinkle with salt, and roast for ~30 min, flipping once, until veggies are browned around the edges. While the vegetables are roasting, heat 1 tbsp EVOO in a small skillet. Add the onion and garlic, cook for 1-2 minutes. Add the jalapeno, cumin, and a dash of salt, stirring frequently until onions are translucent and have lost their bite, 5 to 7 minutes. Set aside. Make the dressing. Combine all vinaigrette ingredients plus a generous sprinkle of salt and pepper in a blender. Adjust seasonings to taste. To assemble the salad, chop the cheese pumpkin wedge into large chunks. Mix the veggies from the oven with the veggies from the skillet, plus the black beans. Serve over a bed of spinach, and top with 1 to 2 Tbsp of goat cheese (per serving) and a few spoonfuls of vinaigrette.